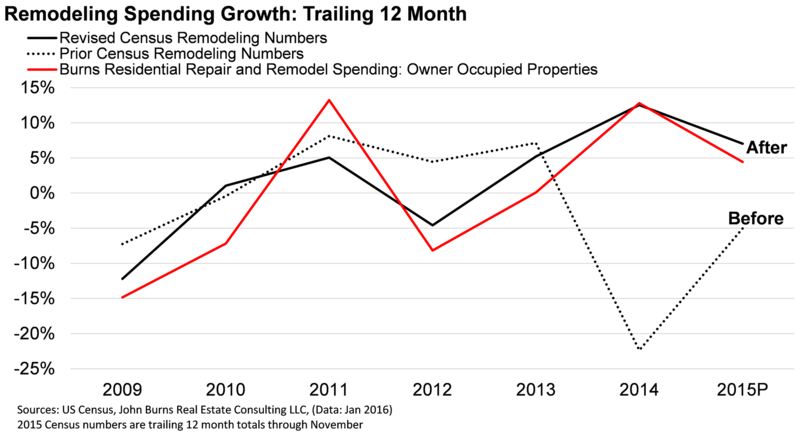 Repair and remodeling spending grew 5%+ last year, just as we predicted. On January 4, the Census Bureau announced a significant revision to their residential improvement spending estimates due to a calculation error. Based on our knowledge of the market, we are not surprised by the direction of the revision. In fact, the restated Census growth curve looks a lot more like our Burns Residential Repair and Remodel Spending™ estimates, which we released back in September 2015. The graph below compares both sets of Census numbers with our proprietary Burns Residential Repair and Remodel Spending numbers for the owner category. In the past 18 months, skepticism has increased toward the prior Census residential improvement spending estimates, but we think this adjustment looks directionally correct. Very few users of the data really believed that the residential improvement market crashed in 2014 (which is what the prior Census data suggested). We did not believe it, and neither did most analysts who cover the segment. Our clients who sell directly to the remodeling market certainly did not report a collapse in 2014. There is virtually no impact. While other well-known repair and remodel forecasts depend on Census C-30 data, our Burns Residential Repair and Remodel Spending figures never have. If the GDP statistic is revised, our historical estimates will undergo a very minor adjustment. Coverage. Our Burns Residential Repair and Remodel Spending figures have about twice the coverage as the Census estimates, resulting in nearly $300 billion of monitored market activity compared to the Census-tracked component of about $145 billion. This is because we track owner and rental projects, including big (major remodels over $5,000; i.e., kitchen, bath, garage, decks) and small (cosmetic updates less than $5,000; i.e., paint, carpet, electrical). The Census improvement numbers only capture owner capital improvement spending but leave out rental projects and small projects. Sample size. Our Burns Residential Repair and Remodel Spending figures are based on a sample size about 10 times larger than the Consumer Expenditure Survey, which the Census uses for their residential improvement spending estimates. Visibility to changes in both project count and spend level. This visibility lets us monitor trade-up and trade-down activity as consumers tackle different types of projects. This type of detail is not available with aggregate spending estimates such as the Census C-30 series. If you have any questions, please contact Todd Tomalak at (920 )373-6727 or by email.